Committing to partners’ growth. CBOSS invests in its partners by offering business motivation and discounts along with training, marketing programs, and technical support. Continuing to innovate. CBOSS never stops developing the award-winning solutions that complement its partners’ knowledge, expertise, and commitment. Keeping it simple. CBOSS has streamlined its processes and simplified partner administration and is moving to globally consistent pricing. 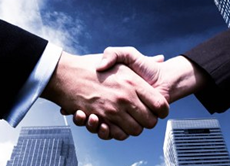 Strategic alliances and partnerships are significant part of CBOSS’ business. We choose our partners in accordance to strict standards and guarantee sustained win-win relationships – in the interests of our customers. We always strive to broaden market presence, which gives you as a dealer or an agent, a perfect opportunity to sell sofisticated, attractive, convergent solutions to your customers. If you are a reseller, system integrator or simply well positioned in the market and your customer base or connections include telecom service providers, then CBOSS could be the right partner for you. With a broad range of best-in-class solutions and products, top-tier global customers, and a solid delivery track record, CBOSS is in business to create win-win opportunities with its partners. If you would like more information on how to become a CBOSS’ partner, please fill in the form and our representative will get in touch with you shortly.